An email conversation I had with VDOT and the City of Richmond in 2008 also indicated that US 33 ends and VA 33 begins at Broad/Harrison and Broad/Hancock. US 33 doesn't get to Broad/Belvidere or any further than that. While in Richmond photographing VDOT County Atlases at the Virginia State Library with Froggie last Saturday, I had an opportunity to field check this. From 9th St westward on Leigh I saw zero VA 33 shields and plenty of US 33 shields, both new and original 1981 postings. Froggie noted no VA 33 shields WB from 25th to the Leigh St Viaduct. So the posting situation has actually gotten worse. As a reminder, it is no longer possible to turn left from US 33 EB Broad St onto VA 33 EB Hancock because a) there is now a median with no opening and b) Hancock is now one-way SB from Marshall to Broad. You can still drive NB on Hancock to Leigh from Marshall and there are still advance US 33 EB trailblazers on Hancock approaching Leigh to turn there. So the next street along Broad EB is Goshen St which is one way NB and also cobblestones. Oddly, there is a US 33 EAST trailblazer shield on Clay St WB saying to turn right (NB) for US 33 EAST. There are then US 33 EAST trailblazers on Goshen at Leigh to turn right. I don't know who the intended audience is for the 33 East shield at Clay/Goshen as there are no shields anywhere directing you to Clay St. It can't be from Gilmer St which is the next street along Broad St EB because that is one-way SB at Broad. The next street is US 1-301 where there is now a TO US 33 EAST shield directing Broad St traffic onto NB US 1-301. I believe the correct answer is that since it is illegal to turn left from US 1-301 SB onto VA 33 EB, you are supposed to turn right at Clay St instead and do a neighborhood clover to reach EB Leigh. Doing this would run you into the Clay/Goshen shield. Regrettably, there is no 33 shield of any sort at US 1-301 and Clay. So the current path of VA 33 EB beginning from US 33 is no longer continuous. The US 33 shield on Clay should be a VA 33 shield, and all US 33 EAST signs on Leigh should be VA 33 signs. Same with the US 33 sign at Broad and Belvidere. The situation with the endpoints wouldn't be as much of a problem if the US 33/VA 33 changeover occurred just at Harrison, which is a two-way street and goes right to Leigh. Of course, the city did replace a US 33/250 unisign at Broad and Boulevard (VA 161) that blew away during Irene with a VA 33/US 250 one...ugh. In any event, does anyone know why this route assignment anomaly is even on Hancock Street? FOR EXAMPLE, did US 33 (maybe via Harrison Street) or its predecessor maybe at one time connect directly with what looks like Sledd Street and curve up into what is US1/301 today? Did the construction of I-64 bisect this connection? It's possible that there was no left turn from Broad to Harrison at one time. Note that there was no route on Leigh until 1981, when SR 33 was rerouted onto the new viaduct. Previously US/SR 33 had used Broad to 25th. It was possible to turn left at Hancock from EB Broad when VA 33 was moved to Harrison/Hancock. 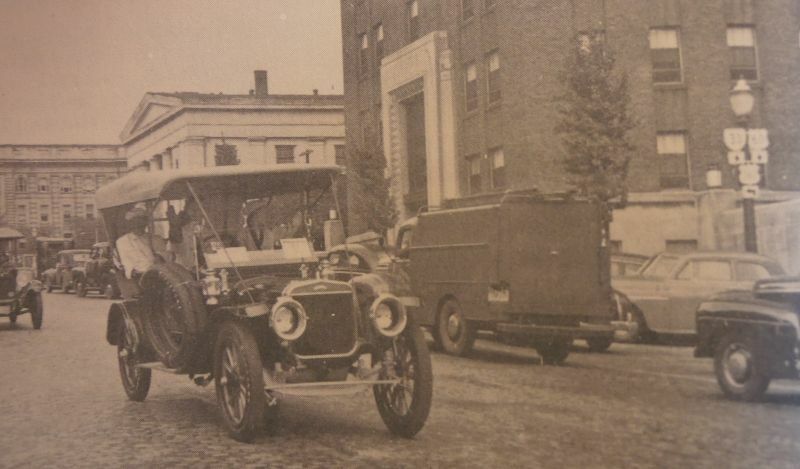 Note that the segment of Chamberlayne where Sledd St meets it was not part of US 1 (or any route) from 1934-59. 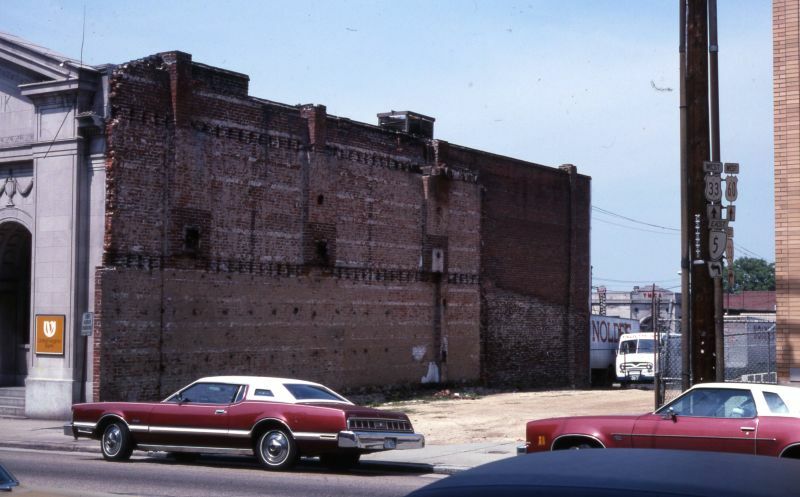 Additionally, per topos, Sledd St never crossed the RR tracks where it curves southwest. The current US 33/VA 33 setup is non-sensical as it stands. Since Harrison is two-way throughout they should just use a neighborhood clover with Ryland to Grace to Harrison for VA 33's EB movement. As it is, traffic heading east on 33 will get to Belvidere and see the sign pointing to east 33 left (but probably too late to get over unless they know ahead of time, and nothing points right on Leigh). So that's probably a reasonable de facto routing. 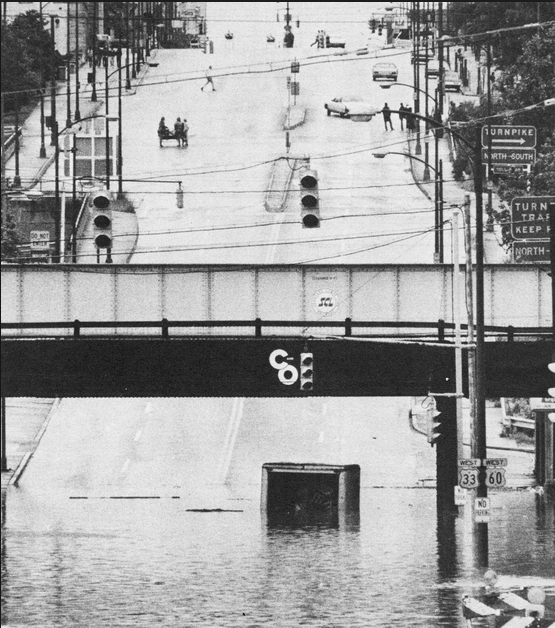 While trudging around the internet looking for old shield photos I came across the first photo below (likely from VDOT but found on http://vintagerva.blogspot.com/) showing Hurricane Agnes flooding from 1972. So here we have US 33-60 posted on Broad St WB. The stoplight that is smacking you in the face is 17th St (US 360). This is definitive evidence that the US 33/VA 33 transition was at US 360 before US 60 was removed from Broad St in 1974, which I had previously believed was the date US 33 moved. The second photo is from the Nov 1949 Virginia Hwys Bulletin, showing WB Broad St at 12th which US 360 used until 1956. This means VA 33 was west of US 360. My working theory now is that US 33 ended at wherever US 60 WEST left Broad until 1956 when it was then extended to US 360 at 17th. I don't know why US 250 never moved until US 60 was removed from Broad west of 21st in 1974. 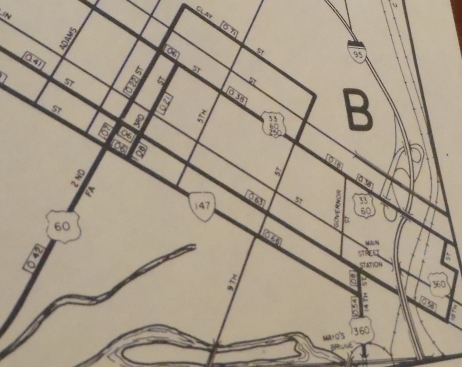 I have a 1969 Henrico County map (third pic below) that clearly shows a US 33-60-250 routing on Broad east to 9th, then only US 33-60 further east, something I had not previously noticed. An astute observer might notice in the mapscan that primary route distance is shown on Broad St to Governor St (from both directions). Did US 250 end there? This would've been essentially ending at the State Capitol. 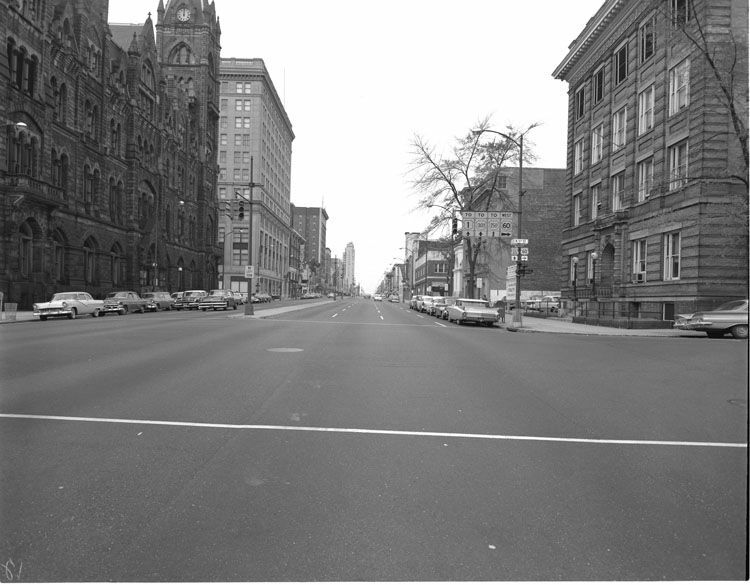 Note the US 33-60 shield was placed east of Governor St when there was room to have placed it east of 9th. CTB references are unhelpful in this. They nearly always describe primary extensions in independent cities in ways that ignore all overlays. Your #1 fallacy is assuming that one photograph is enough proof to change prior hypotheses. It's not impossible that there were sign errors in the 1940s and 1950s. It is the first photo + the mapscan that provide evidence that my original 1974 hypothesis needs revision. The middle photo becomes something closer to what you describe as not enough proof. There is proof that US 33-250 was posted east of US 1-301 back in the day, so it is narrowed down pretty far to where the endpoints would be. I have obtained more evidence on where the transition points have been over time. *The 1939 1:31,680 shows US 33 coming in on Staples Mill, but ending at Broad (jct. US 250). (US 250 in turn is shown continuing east on Broad, ending at Lombardy (jct. US 1, which continued east on Broad). *The 1956 1:24k shows US 33 overlapped with US 250 on Broad as far as Boulevard (VA 161), but east from there Broad is labeled only as US 250 (possibly ending at jct. US 1-301 or US 60). *The 1964 and '68 1:24ks show US 33-250 together east of Boulevard, possibly ending at Belvidere (US 1-301). You are welcome to use on usends.com any photo or mapscan I actually show on those pages with the same attribution I used. If I only provided a link, it is because I was explicitly denied permission to use the photo itself for free. But anyone can link to their photos per their policy. The fact that US 33 and US 250 both run concurrently from the point where they join to a common endpoint really doesn't make a lot of sense to me, especially if US 33 and VA 33 are like US 79 and KY 79 and aren't a continuous route. Either one or other of the US routes should end and only one continue. Of course, US 250 really could be truncated back to Staunton and the road that parallels I-64 could be a state route. US 33 and US 250 do not end at the same location. US 250 continues to US 360 although it is not posted east of I-95 and barely posted east of US 1-301. Photos seem to suggest they haven't ended at the same location back to at least 1951. US 33 and VA 33 have been continuous since 1938 except for 3 months in late 1981. I just wish that VDOT and Richmond would agree on (and correctly sign) U.S. 33/Va. 33 in Richmond, as well as U.S. 250 (always amuses me that poorly-signed U.S. 250 runs down East Broad Street, where the Central Office of VDOT is located). As for extending U.S. 33 east of Richmond to U.S. 17 at Glenns in Gloucester County, why not? Va. 33 could pick up at Saluda in Middlesex County. Only issue is that both parts of Va. 33 are named in honor of U.S. Marine Corps General "Chesty" Puller, but I suppose that just remains that way even if part of the road becomes U.S. 33. When traveling to Richmond a few years ago, I took US 33 all the way to where it intersects US 250, and can't remember which way I turned after that. On a later trip, I was traveling west on US 360 and turned right onto US 250 and followed it all the way out to US 522. Please tell me I ended up driving all of US 33 in Virginia by virtue of those two trips. The endpoint/transition point of US 33/VA 33 is as confusing to me as it is to everyone else. The way I have understood it is that US 33 ends on Broad duplexed with US 250 (at Harrison St according to the VHP). In that case, you have clinched all of US 33 in VA. I should mention that I have marched on Broad from the Science Museum to 7th St back in my high school marching band days in the Richmond Parade. I am probably the only one on the entire forum to march through the end point of a US Route FWIW. This is correct. If you have driven Broad St west of Harrison St (a couple blocks west of US 1-301) to Staples Mill Rd you have driven all of US 33's current routing in Richmond. Incidentally, when I was in scouts a million years ago I marched in a parade through the intersection that has US 176's eastern end point in Goose Creek, SC. Anyone who did the Cooper River Bridge run/walk prior to 1992 (I did this once in the late 1980s), passed through the south end of US 701 and the south end of US 52. I am probably the only one on the entire forum to march through the end point of a US Route FWIW. I marched by the historic endpoint of US 227 in Richmond, Ky. as a high school student and band member. The end shields I emailed Richmond about a while ago still have not been posted, nor has the VA 147 direction conundrum been corrected. I'm likely going to be emailing them again in a couple weeks, although the 90 days have been up for some time now. I believe that these end shields were never posted. I might raise the issue again when the new mayor takes office. The easy solution would be just make VA 33 part of US 33. US 33 is one of those highways that probably should be decommissioned. After all, how much through, Richmond-to-Elkhart traffic is there? And it's improperly numbered, as it runs more east-west than north-south and is signed E-W in every state through which it passes besides Indiana. Says the guy who just finished off US 33 by driving it in its entirety from Elkhart to Ripley.